Dogwood Canyon Nature Park sprawls across the Missouri-Arkansas border, just south of Branson, MO. The entrance is located on Missouri Highway 86, approximately 16 miles west of U.S. Highway 65. Many opportunities await you within this amazing 10,000 acre slice of Ozarks paradise. The park is also a great place for memorable Group Events, such as customized tours with delicious streamside meals Call 417-348-3322. Or, plan a beautiful Wedding at the Hope Wilderness Chapel by calling 417-348-3320. 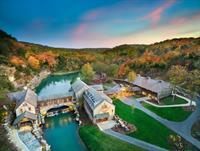 Dogwood Canyon is accessible to our guests with disabilities. Take Hwy. 65 south out of Branson approx. 10 miles until you reach Hwy. 86 and go west approx. 16 miles until you reach Dogwood Canyon on your left.